Centennials are always cause for celebration, and the International Association of Amusement Parks and Attractions (IAAPA) did theirs in grand style as they shattered attendance records at the annual IAAPA Attractions Expo 2018. A record 42,000 registered attractions industry professionals, an increase of 3,000 from last year, gathered to learn, buy, and network during the association’s 100th anniversary celebration. Attractions industry professionals from around the world came together to discover the latest products and technologies on the trade show floor, learn from industry experts during the education conference, and build connections with attractions industry colleagues. 26,600 qualified buyers, an increase of 1,300 from 2017, participated from around the world. These included executives from amusement parks, water parks, family entertainment centers(FECs), zoos, aquariums, museums, science centers, resorts, and attractions. “This year’s IAAPA Attractions Expo was once again a very positive experience for Simworx and a very successful four days,” said CEO Terry Monkton. “We doubled the size of our booth for 2018 and exhibited a fully operational example of ParadropVR, an immersive, interactive, virtual reality attraction, which enables users to enjoy an exciting paragliding experience. This was in constant use during the show and was extremely well received by attendees. “We were also promoting our full range of media based products, which includes 4D/5D effects cinemas, Immersive Tunnels, Flying Theatres, AGV (Advanced Guidance Vehicle) dark rides and the recently introduced Immersive Adventurer simulator, and had a lot of interest in these products from operators of a variety of venue types. Christie meanwhile, had the latest addition to its lineup of RGB laser projectors, which launched on November 12, on view in a static display. Engineered specifically for complex installations including theme park attractions and giant screen experiences, this projection solution features an ultra-compact projector head, said to give customers the flexibility to install projectors in places and spaces not previously possible. Kees Albers, CEO of Unlimited Leisure was pleased to see buyers becoming more aware the total of solutions the company has to offer. “We certainly had a best ever IAAPA show with such a lot of high quality enquiries from around the world for example new generation snow parks including our own developed “Marmots” IP; people are eager to see the opening of our Snow Park in Oman early 2019. 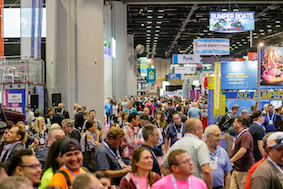 “IAAPA in Orlando is much more than an exhibition. It’s a culmination of all the efforts of thousands of talented professionals showcasing their very best. It’s a melting pot of friends, professionals and everything to do with entertainment. It resonates with our mission of ‘We Create Happy Moments’,” explained Arihant CEO Mr. Jagat Parikh. 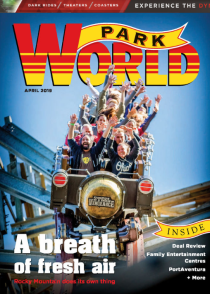 Speaking on behalf of Aquatic Development Group, Julie St. Louis told Park World: “We focused on promoting our line of water ride attractions – our newest water ride, Tidal River, opened at Canobie Lake Park this summer in NH. We also focused primarily on our upcoming projects that will be opening in 2019, such as the SoundWaves indoor/outdoor waterpark opening at the Gaylord Opryland resort in Nashville, TN and the Kartrite indoor waterpark opening in the Catskills, NY. “All of our upcoming projects were well received due to their innovative nature and mix of attractions, we had great traffic to our booth and lots of good meetings with current/potential clients. ProSlide introduced the RallyRACER at IAAPA. Each RallyRACER rider speeds belly-down on a mat through a tight 360º loop complete with intense Gs, and then the loop accelerates riders onto the RallyPOINTS: open racing lanes with low separator lanes that allow racers to see and hear each other as they rocket competitively through drops with bumps, creating speed, compression and zero-gravity moments. It is available in configurations of 2 to 10 lanes. ProSlide also introduced the Dueling PIPEline. High above the pool, 1- or 2-person tube-riding competitors launch themselves into side-by-side tunnels for a thrilling race to the bottom. Each rider speeds through tight loops, and then riders accelerate into the exciting and competitive RallyPOINTs, where riders can see and hear each other as they fly through the side-by-side course. “It’s been excellent,” said Vekoma’s Charlotte van Etten. “We have had overwhelming meetings and lots of walk-in traffic. We’ve been busy all week. At this year’s Kickoff Event, IAAPA also revealed its new logo and brand that will officially debut on January 1, 2019. In 2019 the IAAPA Attractions Expo will again be held in Orlando from November 18 to 22. Mark your dance card now. 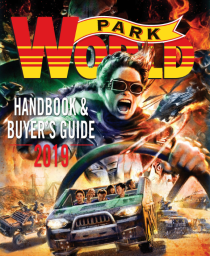 More to follow in the January edition of Park World.